Welcome to another installment of If My Book, the Monkeybicycle feature in which authors shed light on their recently released books by comparing them to weird things. 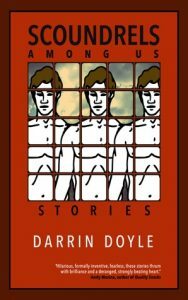 This week Darrin Doyle writes about Scoundrels Among Us, his story collection out now from Tortoise Books. If Scoundrels Among Us were a cloud, it would be low, gray, and fast-moving—a nimbostratus. You would feel the pressure in the air and pray for rain. If Scoundrels Among Us were an illness, it would require a regimen of antibiotics taken once daily with food. Take until gone. If Scoundrels Among Us were a vacation, it would be a tour of an Arizona ghost town, a daylong sweat and burn that visits your dreams for weeks to come. If Scoundrels Among Us were an ‘80s horror movie, it would be Sleepaway Camp, low-budget, unpretentiously filmed and acted, gleefully savage, making you laugh in fear before revealing its bizarre surprise. If Scoundrels Among Us were your girlfriend or boyfriend, it would be a great listener and spoon you and brew your coffee in the morning and never ask about your past. If Scoundrels Among Us were a fruit, it would be a fat red strawberry begging to be eaten right now. But then it would be dropped onto the park grass and swarmed by ants. If Scoundrels Among Us were a body part, it would be skin, capable of bleeding, breathing, and sweating. With a mild case of psoriasis. Fair skin, too, requiring SPF 30+ sunscreen on even a mild summer day. If Scoundrels Among Us were a cemetery, it would be a bobblehead cemetery. If Scoundrels Among Us were a restaurant it would be open 24 hours a day, serve breakfast anytime, and allow smoking. Darrin Doyle’s most recent book is the story collection Scoundrels Among Us. He has previously published two novels—The Girl Who Ate Kalamazoo and Revenge of the Teacher’s Pet: A Love Story—as well as the story collection The Dark Will End the Dark. He believes in Bigfoot, shaves on days of the week that contain the letter T, and teaches at Central Michigan University. His website is darrindoyle.com and you can follow him on Twitter at @DoyleDarrin.